THE BEANS :: Coffee goes stale quickly and the process goes even faster when the beans are already ground, so stick with whole beans. If you're stuck with a grocery store brand be sure to look for a roasting date on the package so you can get something fresh-ish. THE GRIND :: Coffee gets its flavor and aroma during a process called extraction when the hot water passes through the ground up beans. If this happens too quickly, the coffee will be weak; if it happens too slowly, it will be bitter. The speed of this is decided by how fine the grind of the coffee is. Flat Bottom Filters: Medium (close to the texture of sand). Cone Shaped Filters: Medium/Fine (A little finer than granulated sugar). THE WATER :: Since a cup of coffee is mostly water, the quality of that water is important. If you live in an area where tap water isn't very good then use filtered water for your coffee. You might think the taste of coffee can overwhelm the taste of bad water, but it doesn't. THE RATIO :: You need to play around and get your water to coffee ratio right. In general, you want about 1 or 2 tablespoons of ground coffee per six ounces of water. Your preferences may vary, so feel free to try different amounts. Once you get a good ratio, stick with it. 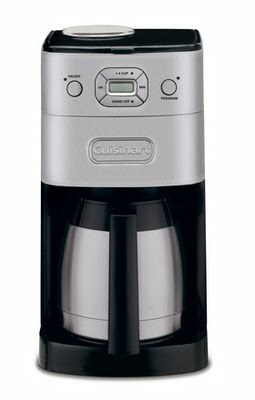 THE POT :: If you're in the market for a new coffee maker it's worth it to splurge on one that pours directly into a thermal carafe because they don't use the heating element that burns coffee. THE CLEANING :: If you're making coffee every day it's important to clean and spray out the carafe daily because otherwise you're just getting a second taste of yesterday's brew. You should also clean out the whole system at least once a month, but if you're a daily drinker then once a week is recommended.